It's official, I'm addicted. To elastic thread. So much so that I dreamed that I made a white tunic for Jim Morrison with shirring at the elbows and somewhere else (I can't recall where ... such is the way of dreams). Sadly, the tunic I designed looked exactly like a bathing suit cover-up I have so I'm thinking the dream is not an indication that I should go into fashion design. 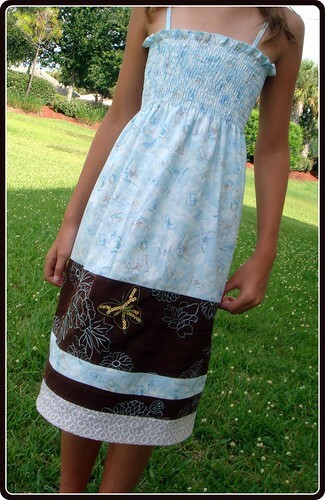 These shirred sundresses are so much fun and so easy! And the recipient, M., loves, loves, loves them ... making it even more rewarding. This is the second one I've finished for her. Here is the first. Total time to make it was about 2 hours. It would have gone more quickly except I added the layers to it, and then after it was finished I decided it was really much too short (she looked like a supermodel ready to go on a catwalk in her supermini sundress ... but not like a 10 year old ... she, of course, loved the supermodel idea) so I added the largest brown band. If she grows taller I can add another band ... I love that idea! Maybe someone has some ideas but I can't figure out the rolled hem foot of my machine. 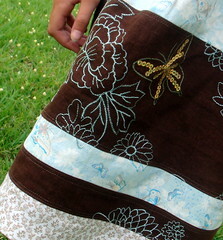 I have an impossible time getting started with it and then I seem to feed it way too much or way too little fabric. Is there a secret to that thing? Pay no attention to the "flowers" growing throughout the yard. I can't keep up with them, not that I've really tried. Maybe we'll just call the lawn "natural" for now. Yeah, that's it, I planned it that way. Very cute. As a mommy of a tall, skinny 3-year-old, I can totally understand the appeal of adding additional bands to make it longer and longer and longer! P.S. The lawn looks lovely with the flowers... I think you shouldn't worry about them and let 'em grow wild. Nature has a plan. I love these dresses! Will you be selling them on Etsy?